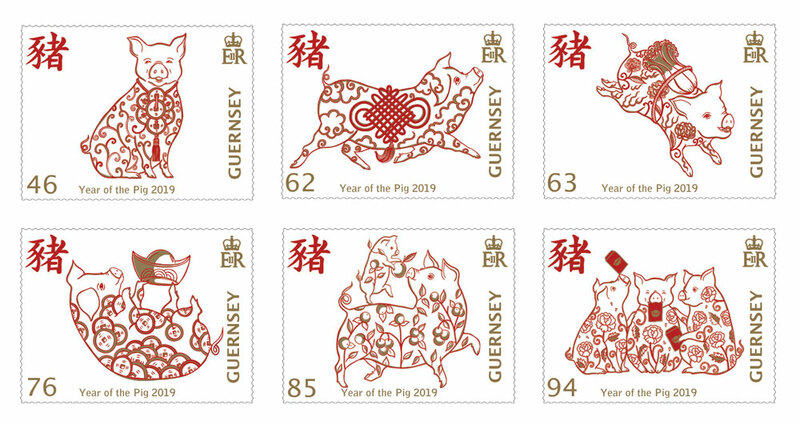 Guernsey Post announces that it will release stamps to celebrate the Year of the Pig, the sixth set in its series to mark Chinese New Year, which falls on 5 February 2019 (stamp issue date: 22 January 2019). Created by Sydney-based illustrator Chrissy Lau, each of the six stamps reflects the pig’s cultural association with an abundance of wealth and prosperity, with the Chinese symbol for pig depicted in gold on each stamp. The Lucky Charm pig (46p stamp) wears a Chinese New Year lucky?charm of coins commonly used as decorations?during the celebrations. Its body is covered with a decorative scroll pattern inspired by Chinese ceramics. Strolling into Life pig (62p stamp) wears the longevity knot, which is also often seen during Chinese New Year celebrations. The cloud pattern is a symbol of peace and good fortune. The pig Leaping into Fortune (63p stamp) wears a cabbage ‘cai’ or ‘xai’, which is often used as a?symbol of prosperity and wealth. The chrysanthemum design symbolises longevity whilst the fire pattern represents intellectual brilliance. The body of the Fortune Sticks pig (76p stamp) is covered in gold ingots and coins to symbolise wealth and prosperity, whilst the Fruits of our Labour pigs (85p stamp) are decorated with kumquats, tangerines and oranges, which are considered lucky during Chinese New Year. Completing the set are The Three Pigs (94p stamp) with a peony pattern on their bodies to symbolise wealth and achievement in life. The red packets are filled with money, which are traditionally given out during Chinese New Year. The stamps are available to pre-order from 4th January 2019 at www.guernseystamps.com or by calling Philatelic Customer Services on +44 (0) 1481 716486.